I interpreted last few month’s economic releases as showing somewhat stronger economic growth in the US. 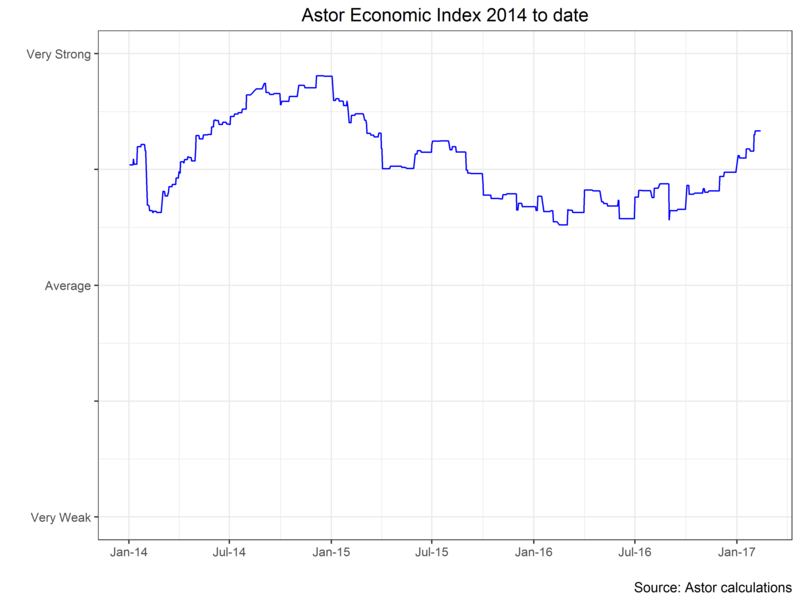 Our latest reading for the Astor Economic Index® (“AEI”) is higher over the month and has been moving steadily higher since the election to its highest level in about 18 months. I still see the US as currently growing above average. The increase has been driven by the output factors we monitor. The AEI is a proprietary index that evaluates selected employment and output trends in an effort to gauge the current pace of US economic growth. The most recent nowcasts produced by the Federal Reserve banks of Atlanta and New York are both stronger than the 1.9% advanced estimate for GDP growth in the last quarter of 2016. The Atlanta Fed is currently estimating a 2.7% SAAR for the first quarter of 2017 and the New York Fed is currently forecasting 3.1%. The most dramatic shift in the last few months has been the improvement in the manufacturers purchasing managers index, an indicator which in the past has been useful in forecasting with increased output. This index measures trends in a somewhat subjective way, but we see more concrete signs of activity when looking at output. 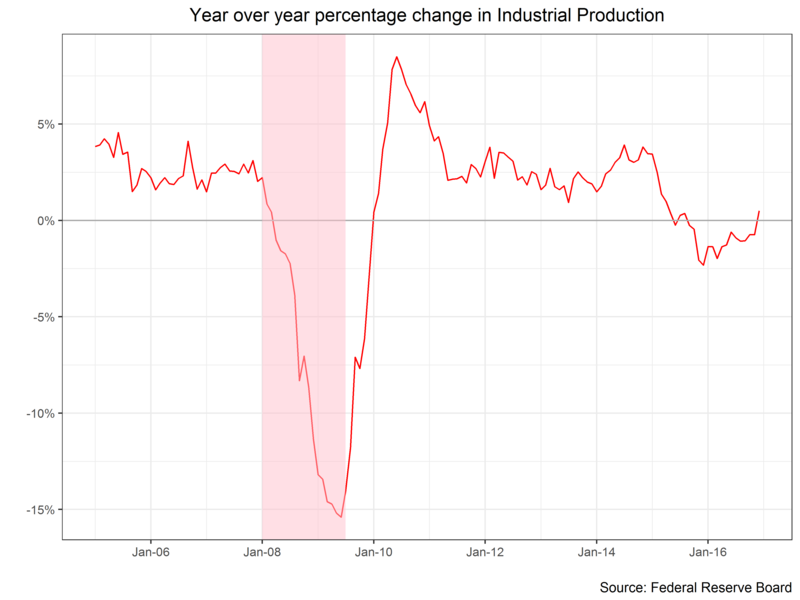 For example, year on year industrial production has turned positive for the first time since August 2015. Another piece of good news is that the international growth environment has improved, though this has yet to show up in US net exports. This may be because of the continued high level of the dollar, though it has moderated recently. Both the improved expectations as measured by surveys of purchasing managers, consumers of economists are all promises of strength to come. Gross domestic purchases have improved but are still below the average of the last expansion. Will the strength in the economy lead the fed to raise rates faster? Their last statement was cagey as usual. The odds for an early fiscal stimulus from the incoming administration may have lengthened as the President and Congress do not appear to be united in either goals or methods. Furthermore, the rancorous confirmation process for the President’s cabinet has distracted the Senate where radical change will be a harder sale. Though there is no clear need to take action from changes in tax policy, the Fed still needs to follow its statutory responsibility of attempting to maintain price stability and full employment. There has been no end to the pattern of strong jobs growth and no sign of inflation. One interpretation of this is that there is more slack in the labor market than the low level of unemployment or the substantial improvement in underemployment suggest. 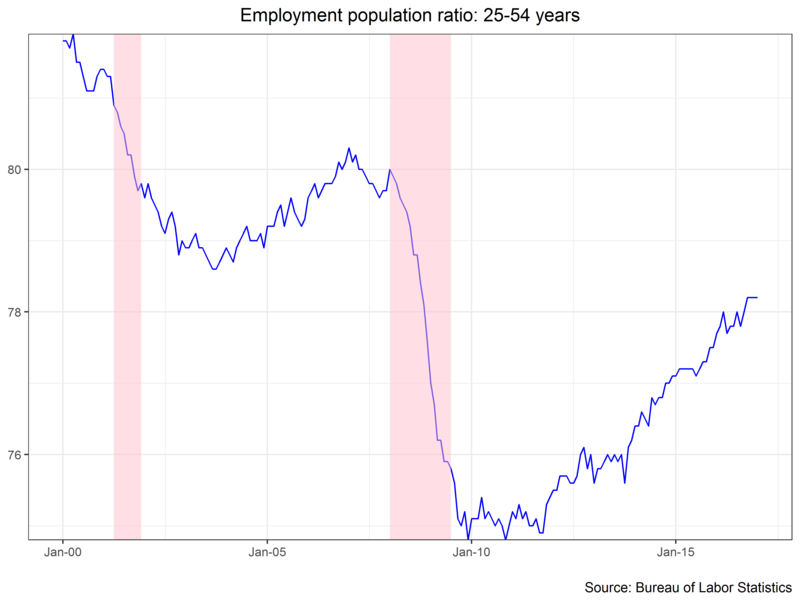 I think we can see this in the prime aged employment population ratio. This is a measure which shows what percentage of 25-54 year olds are employed. Focusing on a narrower age gap means that the we are not distracted by some of the effects of an aging population on employment. The chart below shows steady progress in 2012-2015, but perhaps a pause in 2016. If I am right that there are still more potential employees on the sidelines than one would typically expect with a 4.9% unemployment rate, the Fed could hold off on its hikes and disappoint bond bears again. On the other hand, early signs of increased core inflation could make a Fed eager to put more distance between themselves and the zero bound. Like a gun thrown into a drawer in the first act, the Fed’s balance sheet holds steady at about $4.5 trillion, (at about 23% of GDP when the average before the global financial crisis was about 6% of GDP). I wrote a note in 2013 which I have not needed to update, as the Fed still maintains that they will stop re-investing principal and interest payments (thus passively reducing the size of the balance sheet) once interest rates are normalized. Economist Tim Duy dissects a recent speech for Bloomberg here. I don’t think the Fed is ready to talk about the balance sheet, but it is ready to talk about talking about it. We will take progress where we can. Overall the economy continues its recent path of growth. With some encouraging signs overseas we can be hope that this year will be on the upper end of the recent range of growth. As always we will continue to monitor the economy closely.